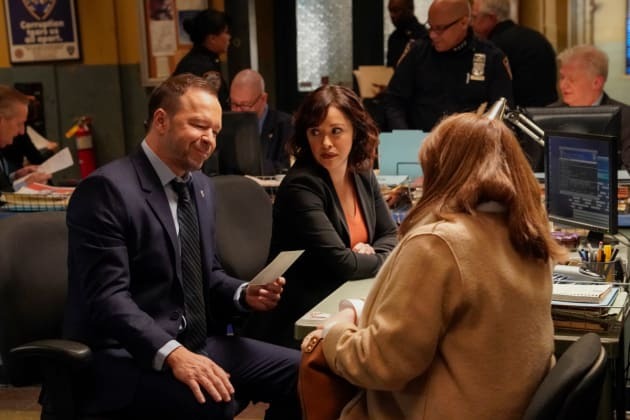 Danny (Donnie Wahlberg) and Maria (Marisa Ramirez) do their best to put their skepticism aside to work with a medium on Blue Bloods Season 9 Episode 13. Blue Bloods Season 9 Episode 13: "Ripple Effect"
Archbishop: We're looking for pen pals to write to the incarcerated. Frank: I'm a little busy putting them away. I don't think I'll have time to write to them too. Permalink: I'm a little busy putting them away. I don't think I'll have time to write to them too. Nicky: A little more champagne, and I'm gonna try one of these on. Erin: No, you won't. You're not allowed to get married til you're 30. Permalink: No, you won't. You're not allowed to get married til you're 30.